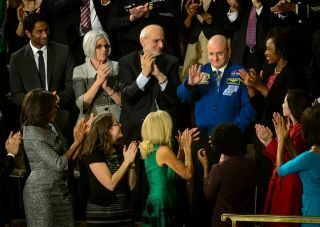 NASA astronaut Scott Kelly stands as he is recognized by President Barack Obama, while First lady Michelle Obama, front left, and other guests applaud, during the State of the Union address on Capitol Hill in Washington, Tuesday Jan. 20, 2015. President Barack Obama recognized the first American astronaut who will spend a year in space during the State of Union address Tuesday night (Jan. 20). NASA astronaut Scott Kelly, scheduled to launch to the International Space Station for a 12-month stay in March, was hailed for his role in advancing Obama's goal of sending astronauts to Mars. Kelly attended the speech as a guest of First Lady Michelle Obama. "Last month, we launched a new spacecraft as part of a re-energized space program that will send American astronauts to Mars," Obama continued, referring to the launch of NASA's first Orion crew capsule on an unmanned test in December. "And in two months, to prepare us for those missions, Scott Kelly will begin a yearlong stay in space." Kelly, wearing his blue flight jacket with the patch of his one-year mission, stood and waved in response to a standing ovation by the members of Congress gathered in the House of Representatives chamber of the Capitol Building in Washington, D.C.
"Good luck Captain!" Obama proclaimed, raising his voice to speak over the applause for Kelly. "Make sure to Instagram it. We're proud of you." Kelly is scheduled to launch on a Russian Soyuz spacecraft to the International Space Station in late-March. He and cosmonaut Mikhail Kornienko will live and work on the orbiting outpost for one year. Kelly and Kornienko's flight will mark the first time an American astronaut has left the planet for 12 months, and it is also the fourth yearlong mission in history — the first onboard the International Space Station. NASA and the Russian Federal Space Agency Roscosmos are looking toward Kelly and Kornienko's mission to gather physiological data supporting longer missions into space. "Imagine carrying out hundreds of scientific and research experiments, every day, for a year ... in space," White House officials wrote in a blog previewing Kelly’s attendance at the State of the Union. "Not only will he be conducting studies on cutting-edge technology development, he and his crew will compare medical data from Scott and his twin brother astronaut Mark Kelly to see how the human body responds over time in space." Three years ago, it was Mark Kelly, rather than Scott, who was at the First Lady's side at the 2012 State of the Union. Rather than representing NASA, Kelly, by then a former astronaut, was there to accompany his wife, then-Arizona Rep. Gabrielle Giffords, who suffered a gunshot wound to the head during an assassination attempt a year earlier. On Tuesday night, in addition to saluting Scott Kelly and the recent Orion flight, President Obama also mentioned NASA’s role in studying the Earth’s climate. Robert Z. Pearlman is a Space.com contributing writer and the editor of collectSPACE.com, a Space.com partner site and the leading space history-focused news publication. Follow collectSPACE.com on Facebook and on Twitter at @collectSPACE. Follow us @Spacedotcom, Facebook or Google+. Original article on Space.com.